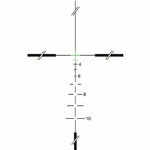 This ACOG 3.5x35 scope with Green Crosshair Reticle is calibrated for 5.56 (.223 cal) flat-top rifles to 1000 meters. Includes Flat Top Adapter. Daytime illumination is provided by fiber optics and Tritium illuminates the scopes at night.